I often describe the Elder Scrolls games as just about as close to an MMORPG as you can get in a single player experience. You’ve got your massive open world, your highly customizable player character, a collection of interesting races and geographical locations, and all the lore you could hope for. So when The Elder Scrolls Online was announced, I thought it was a brilliant idea. All the pieces seemed to fit! It should come as no surprise that it was with a sense of optimism that I sat down to play a demo of the game at E3 2013. Finally, an Elder Scrolls game I can play with my friends! Finally, an opportunity to explore the entire continent of Tamriel! And finally an MMORPG that would be more than just the usual business of killing enemies, collecting trophies and adding incrementally different abilities to the quick bar! I’m sad to say it, but my experience with The Elder Scrolls Online was pretty much just the usual business. I selected an Orc character that was built to be a warrior of sorts, and began exploring the game world. After some wandering and appreciating the visuals, I came across a quest giver who asked me to kill a bunch of bad guys, collect a bunch of things and to generally save the day. So I did. Yes, there was more to the quest than just killing and collecting; I had to destroy some traps, set a couple of things on fire and blow a horn too. But there was nothing about that particular quest to make it stand out from your average MMORPG quest grind. 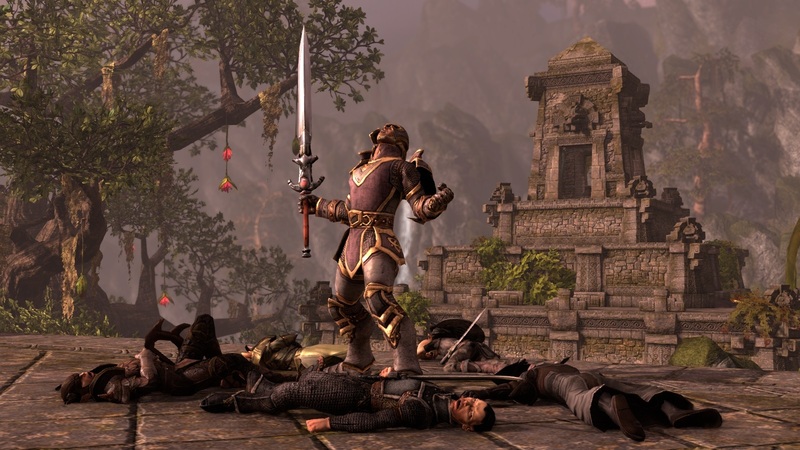 Throughout the quest I was able to get a feel for the combat in The Elder Scrolls Online and found that it is more in line with other MMORPGs than the Elder Scrolls games. Admittedly, the first person view was not implemented fully in the demo that I played (no visible arms or weapons for that view), so I was forced to stick to the 3rd person view in combat. I was able to swing my weapon by clicking, and make more powerful attacks by holding the mouse button down and releasing when ready–though it would automatically unleash the attack after a few seconds of charging. I felt right at home with those attacks… but then I noticed the quick bar. Sure enough, mapped to the number keys were a variety of abilities and in using them in combat, I immediately felt like this was the same old MMORPG battle that I’ve fought through millions of times since Everquest. It wasn’t just the quick bar, but also the way the enemies were placed around the quest area. There were a lot of them! It was a much more dense collection of enemies than I’m used to from the Elder Scrolls games. And they stand around in typical MMORPG fashion waiting to be attacked, but they have a ridiculously limited line of sight or aggro range. They are there simply to be defeated, to drop quest items, and to respawn for the next player. Yes, there are mudcrabs. Yes, there is a highly detailed character creation system. And yes, the entirely of Tamriel can be explored. But if the entire game is filled with the mundane combat that I experienced in the demo, I might just have to patiently wait for Elder Scrolls VI instead. Having said that, what I experienced was an incredibly small part of an enormous game that is still in development (and scheduled for release Spring 2014). As a passionate fan of the series, I still maintain some optimism about The Elder Scrolls Online, purely on my faith in the brand. I hope my next experience with the game is more fulfilling.